The LG v30 has been officially unveiled at IFA 2017, in Berlin. The phone features a full metal unibody with Corning Gorilla Glass 5 on the front and the back. The V30 features a 6.0-inch 18:9 OLED FullVision display, and supports QHD+ 2880 x 1440 pixels resolution, with a pixel density of 538 ppi. LG has substituted the ticker display, with an Always-on Display and a floating bar. The AOD displays shortcuts to quick tools and music player, while the Floating bar allows the user to place shortcuts for 5 apps. Optionally the bar can be dragged to the side to remove the option. 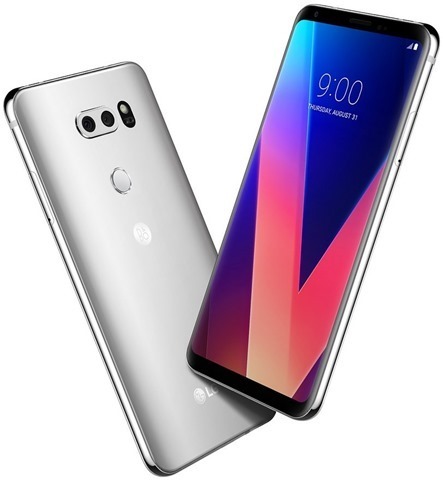 The LG V30 retainbs the Knock Code pattern gesture for unlocking the screen, and has a fingerprint scanner on the back panel for biometric authentication. The LG V30 runs on Android 7.1.2 Nougat with LG UX , and is powered by a Qualcomm Snapdragon 835 processor, with an Adreno 540 GPU, and 4GB of LPDDR4x RAM. The phone has 64GB of internal storage which uses UFS.20, and supports up to 2TB of expandable storage. There is a higher storage variant with 128GB internal memory, and it is called the LG V30+. But it is identical to the rest of the V30's tech specs. The LG V30 has dual rear cameras, the primary of which is a 16 megapixel standard angle camera with an f/1.6 aperture, 71° lens, Optical Image Stabilization (OIS) and Electronic Image Stabilization (EIS), with hybrid autofocus which uses Phase Detect Auto Focus (PDAF) and Laser autofocus. The secondary camera is 13 megapixel 120° wide angle lens with an f/1.9 aperture. The selfie snapper on the V30 is a 5 megapixels 90° wide angle lens, with an f/2.2 aperture. 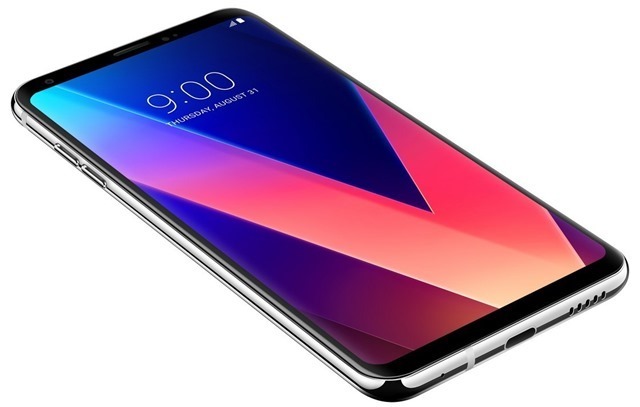 The LG V30 is backed by a 3,300 mah battery which supports Qualcomm Quick Charge 3.0 and Wireless Charging, and weighs 158g, and measures 151.7 x 75.4 x 7.3mm. The LG V30 has a 32-bit Hi-Fi Qaud DAC from Bang & Olufsen, with a lone speaker grille at the bottom, and a 3.5mm headphone jack. The phone has a heatpipe and a cooling pad in it, for quick heat dissipation. 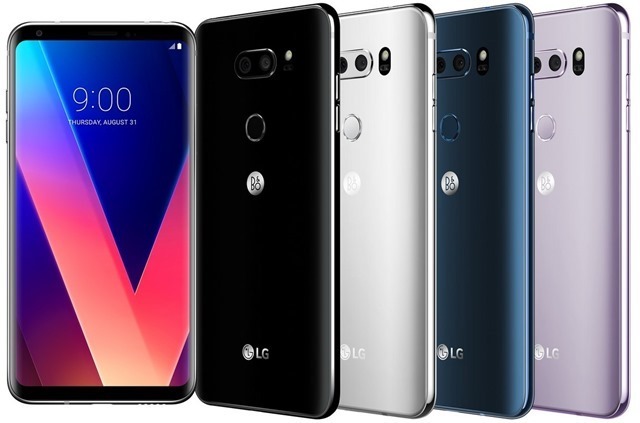 In terms of connectivity, the V30 supports LTE-A 4 Band CA, Wi-Fi 802.11 a, b, g, n, ac, Bluetooth 5.0 BLE, NFC, USB Type-C 2.0 (3.1 compatible)/ The LG V30 is IP68 certified for water and dust resistance, and MIL-STD 810G compliant. The LG V30 will be available in 4 colours: Aurora Black, Cloud Silver, Moroccan Blue and Lavender Violet. South Korea will be the first market to get the LG V30 on September 21st, followed by North America, Asia, Europe, Africa and the Middle East.